Do You Have Experience as a Sales Representative? You Could Be Just What We Need on the DunRite Exteriors Team! 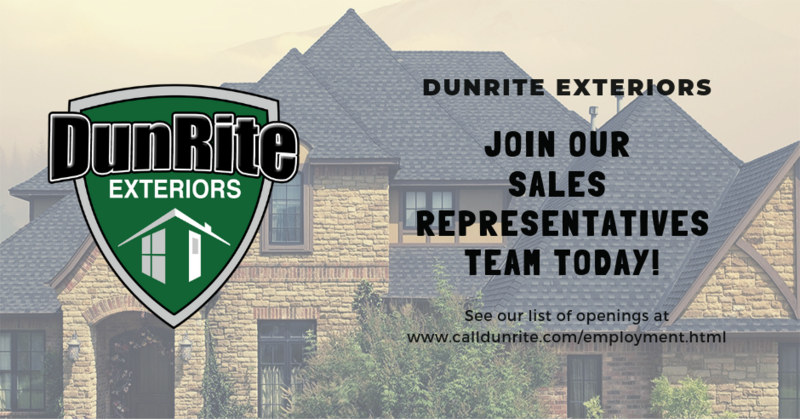 The DunRite Exteriors team is seeking experienced Sales Representatives for in-house demonstrations of our Roofing System. If you think you have what it takes, we would love to have you on our team! Thousands of homeowners have trusted DunRite Exteriors since 1989, and so can you! Don't hesitate and miss out on the opportunity to be one of our newest sales representatives, apply today. NOTE: OUR COMPANY IS A DRUG-FREE WORKPLACE. PRE-EMPLOYMENT DRUG TESTING IS A CONDITION OF EMPLOYMENT. This position requires knowledge and/or understanding of basic roofing and gutter details. You must be able to carry, set, and climb ladders as this position will require inspection of roof/gutter details. You must be technology friendly. This position will require the use of a tablet or mobile device for communicating job and proposal details with our office. We use "Up-front" pricing with no price negotiation. You must be able to close sales based on our Best Product / Best Value / Best Company position. Visit our Employment Opportunities Page to Fill Out an Application Today!